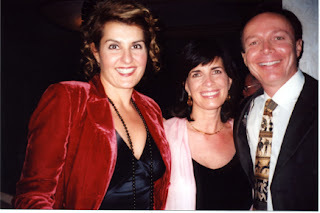 Nia Vardalos raises money for the St. Demetrios Greek Orthodox Church in Camarillo, California and also Blesses CelebrateGreece.com’s Dr. James Stathis and Cynthia Daddona. Nia Vardalos was the MC for a highly successful fundraiser for the St. Dimitrios Greek Orthodox new building Fund. Her inspiring personality and, of course, entertaining humor had Greeks bidding on My Big, Fat, Greek Wedding movie memorabilia that included signed movie posters, scripts and a bottle of Windex! Click screen to play or pause. Afterwards, we talked with Nia and discovered that her Yiayia and Dr. Stathis’ Yiayia were good friends in her hometown of Winnipeg, Canada. When we told her that James is the founder of CelebrateGreece.com and a documentary filmmaker of subjects on ancient Greece and Cynthia Daddona is on-camera personality, former comedienne and author of the amazon.com bestseller Diary of A Modern Day Goddess she asked for Cynthia’s autograph and book. But, best of all when we told her we were making A Greek Islands Wedding documentary and writing a feature film called Goddess and the G®eek she was overjoyed and began rubbing our backs to bless and instill us with her good wishes. OPA!